This is a variation of the Pasta alla Norma, a Sicilian recipe for pasta with eggplant, tomato sauce, and ricotta salata. Instead of making a tomato sauce I used grape tomatoes. 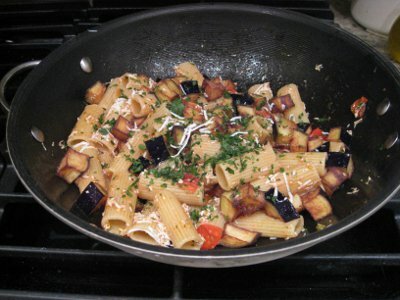 For a lighter version of this recipe you can simply saute the eggplant instead of frying. 1) Heat the peanut oil in a small pot for deep frying the eggplant. 2) Clean the eggplant, cut it in small cubes and roll them in flour so that they will be covered with a thin layer of flour. 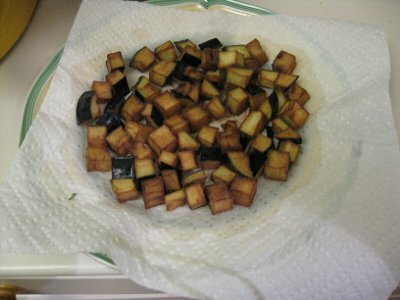 3) Fry the eggplant cubes, few at at a time, and put them on a plate covered with kitchen paper to dry. Add some salt to the fried eggplant. 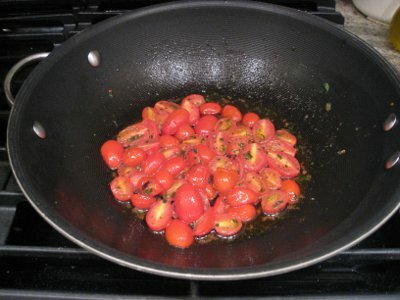 4) Cut the grape tomatoes in halves, and finely chop some parsley. 5) Warm up some olive oil in a wok, and add a clove of garlic halved and a bit of hot chili pepper (if you like it). When the garlic begins to be golden add the tomatoes and then the parsley. Season with salt and pepper. And let cook just a few minutes. 7) When the pasta is ready, drain it and add it to the sauce in the wok. Let it blend on a medium heat and at then add the grated cheese. Mix for a few seconds. 8 ) At the end add the fried eggplants, some chopped basil and mint. Some more cheese, if you like, and serve.